President in Petticoats! Civil War Propaganda in Photographs at the ICP. "...As the American Civil War ground to a dispiriting and unheroic end after the surrender of General Robert E. Lee's rebel forces and the shocking assassination of President Abraham Lincoln in mid-April 1865, Jefferson Davis, President of the Confederate States, became a political fugitive. At dawn on May 10, 1865, a contingent of Michigan cavalry captured Davis in a makeshift camp outside Irwinville, Georgia. In his haste to flee, Davis grabbed his wife's overcoat rather than his own. News reports immediately circulated that Davis had been apprehended in women's clothes and that he was attempting to disguise himself as a woman. Northern artists and caricaturists seized upon these rumors of cowardly escape and created wildly inventive images, some using photomontage, to sensationalize the political story. Photographers circulated and even pirated dozens of fanciful photographic cards; many used a photographic portrait of Davis on a hand-drawn body in a woman's dress, hat, and crinoline, but wearing his own boots, the detail that supposedly betrayed him to his captors." Bill Manbo Papers at the University of Wyoming Collections. "...As a teenager, Bill Manbo Sr. was a Japanese American internee in the Heart Mountain Relocation Center in Wyoming during World War II. During Manbo's internment, he surreptitiously took photographs of everyday life and events in the camp, including children at play, events, and buildings. 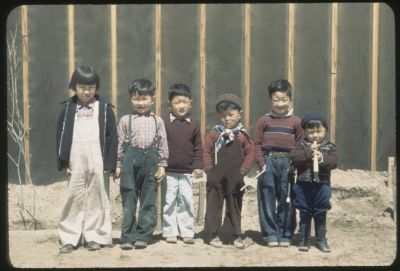 The contains 30 color slides of scenes from the Heart Mountain Relocation Center, dated 1942-1944, two photos from a Cody, Wyoming studio, and a letter from Bacon Sakatani, 7-6-1993 which gives an inventory of the slides, numbered order, and content identified and described." Selections Three: Recently Acquired Paintings and Photographs at Charles A. Hartman Fine Art. "...Selections Three includes new paintings and photographs by gallery artists as well as a number of modern and vintage pieces drawn from the gallery’s extensive inventory of photographic masterworks. Works by gallery artists Holly Andres, Hayley Barker, Jeffrey Conley, Rachel Davis and Daniel Robinson are presented alongside classic photographs by Ruth Bernhard, Edward Curtis, Robert Doisneau, John Gutmann, Alfred Eisenstaedt, Horst P. Horst, André Kertész, Willy Ronis, Arthur Rothstein, Edward Steichen, Garry Winogrand and others." Revolutionary Ink: The Paintings of Wu Guanzhong at The Asia Society, New York. 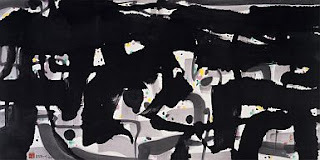 "...Wu Guanzhong (1919–2010) stands as one of the most important artists of twentieth-century China. Born in Jiangsu Province, Wu studied art at the National Academy of Art in Hangzhou (today’s China Academy of Art) and, from 1947, in Paris at the École nationale supérieure des beaux-arts. He returned to China after three years and taught at the Central Academy of Fine Arts in Beijing. His works were condemned before and during the Cultural Revolution because his oil paintings did not comply with the political interests of the time. In spite of this he continued to paint and emerged as a national cultural figure whose works came to be celebrated inside and outside China. He is also well known for his eloquent writings on art and creativity that sometimes led to controversies and spawned heated debates among Chinese artists and intellectuals. Wu Guanzhong created works that embody many of the major shifts and tensions in twentieth-century Chinese art—raising questions around individualism, formalism, and the relationship between modernism and cultural traditions." Miguel Gandert - Saints and Sinners: Rituals of Penance and Redemption at Andrew Smith Gallery. "...Over the last four decades Gandert has compiled a monumental document of Hispanic religious life, Hispanic artists, dwellers on the Mexican/American border, and confluences of Spanish Colonial and Mesoamerican indigenous traditions. In "Saints and Sinners: Rituals of Penance and Redemption," he has enlarged his photographic document of the sacred and secular rituals of mestizo people of the Rio Grande corridor that first appeared in his book Nuevo México Profundo: Rituals of an Indo-Hispano Homeland." Happy Birthday to my daughter Amy - 19 years old today. The Videos of Sue de Beer (2004-2012) at UbuWeb Film & Video. "...six videos works by New York-based arist Sue de Beer, inspired by everything from ideas of mysticism to the novels of Dennis Cooper. Randy Kennedy, writing in The New York Times says of de Beer's works, 'Time itself is the most often repeated subject of de Beer's work, emerging from images and ideas related to the passage of time. Ghosts, haunting, adolescence, trace memory and erasure find a common ground within this theme.' Featured here are Disappear Here (2004); The Quickening (2006); Room 309 (2010); The Ghosts (2011); Silver and Gold (2011); and Untitled (2012)." Lens Culture... Memory of the Image - Photographs by Jerzy Lewczynski. "...If I find a photograph of a woman, once kept in a wallet by a father or husband who went to war and died, then this photograph is saturated with certain impulses, with the energy of a bygone time, with the conditions of that time, even with its smell. I am extremely fond of all the scratches and imperfections. One day I’m walking in Gliwice and I find a negative lying in front of me. I pick it up. On it is a mother with her child and I know that this mother has gone, that the child has gone, and only the negative has remained. We cannot leave these things behind; we must find a way to reconstruct."